Emerald Seed Products is aware that the plant their products are derived from may be Greek to potential customers. But the lack of consumer knowledge about fenugreek has not deterred Emerald Seed Products from exploring new markets. Today, the company’s products are exported to the U.S., Japan, Taiwan, Thailand, Israel, Bangladesh, South Korea, France, and the Philippines. Emerald Seed Products was launched in 1994 by Nathan’s father Blaine and his business partner Cal Kelly. Early on, the owners were approached by Al Slinkard, who is considered to be a key builder of Canada’s half-billion-dollar pulse crop industry. Slinkard has advised pulse growers in virtually every municipality in Saskatchewan over the past 28 years while authoring over 300 books, journals and extension publications. Slinkard, who has developed many lentil and pea varieties, was interested in developing a manufacturing process that would effectively and efficiently extract the fenugreek fibre from the seed for use in the diabetic market. As Nathan notes, what followed was a major learning process including significant time spent on research and development. During this time, Emerald Seed Products developed a new processing facility from scratch. 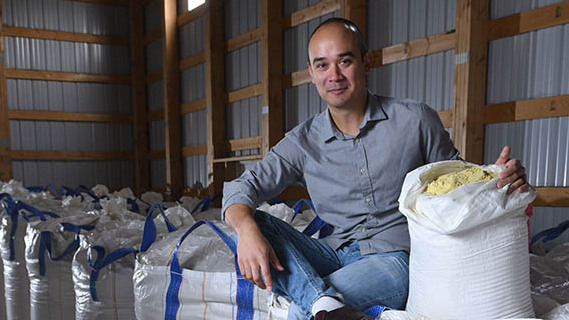 From the beginning, Emerald Seed Products sought out Saskatchewan farmers to grow the fenugreek. Due to the lack of information out there, Nathan said the company had to educate growers. It publishes growing guidelines that are updated every year. Although Emerald Seed Products was initially started to enter the diabetic market, the company discovered there wasn’t much potential for growth. The company received a welcome surprise, however, when they were able to enter the mining industry with their product FenGum®. The other products the company has developed include Nutrifen® (natural animal feed additive) and Canafen® (fenugreek food grade gum for use in food and nutraceutical applications). Nathan said the process of introducing their products internationally has been one based on building relationships. Thanks to a relationship developed with a distributor in South Korea (Daehan Chemtech), Emerald Seed Products was able to move into that region. The company attended a trade show in South Korea and formed a research and development partnership with Dankook University. A year later, the company went back to South Korea to tour farms and talk to farmers. This year, Emerald Seed Products has been recognized for its success: Nathan won the 2017 Saskatchewan Young Professional and Entrepreneur (SYPE) Silver Spade award for Young Entrepreneur of the Year, while the company received the 2017 Family Enterprise Exchange (FEX) Regina Family Enterprise of the Year Award. Prior to joining the company, Nathan was a senior accountant at Virtus Group LLP. He joined his father’s company as marketing manager in March 2013, became the chief operating officer in January 2014 and CEO in July 2016. Moving forward, Nathan is confident that Emerald Seed Products can take their products derived from a little-known plant and build on their global network.